So, yesterday was exciting. Little baby Pure Delicious came out into the world, and I am completely humbled by the response which has been so wonderful. I hope that if you are a regular reader or you found this blog because of your own eating style, (which would mean that this kind of food is your deal ) that you will look into picking up a copy– I really saved so many special recipes for this book, and I know you will love them! Today, Wednesday, I am doing a fun segment on New Day Northwest, whipping up a few recipes for you and I will be sure to post it on facebook later so you can check it out- also, follow the fun backstage on snapchat! (HeatherChristo). 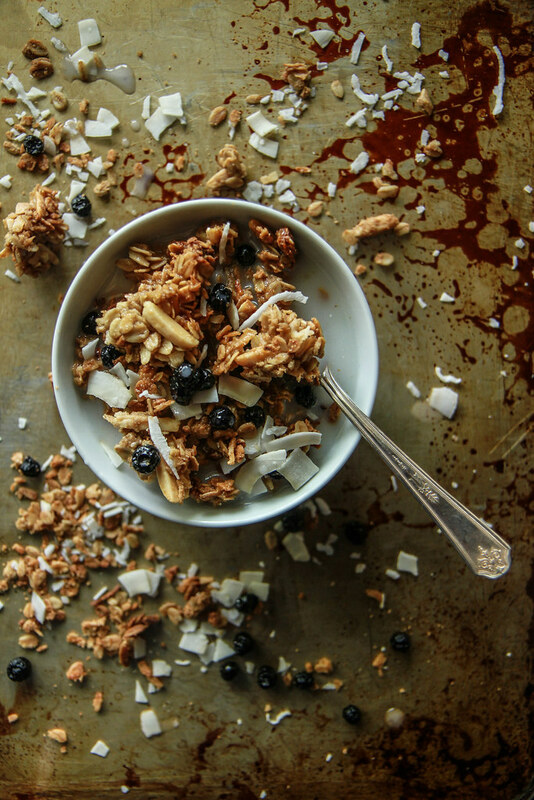 So onto breakfast: Coconut Blueberry Almond Granola to be exact. This is the second batch I have made of this in the last few weeks. Well, the first batch I made with Sun butter (if you have a nut allergy, this is an epic substitute in this recipe!) and then this last time I made it will almond butter and added the toasted almonds- delicious! My kids like to snack on it plain (the big chunks especially) and definitely pick out the dried blueberries. I then take all of their dried blueberries and add them to my granola which I like to have cereal style with cold coconut milk (SO GOOD!!) Pete has been sprinkling it on vanilla (vegan) ice cream- also a nice choice if I do say so myself! However you eat it, you should try this out very, very soon because it is so delicious, and then watch it disappear lightning fast in your house. 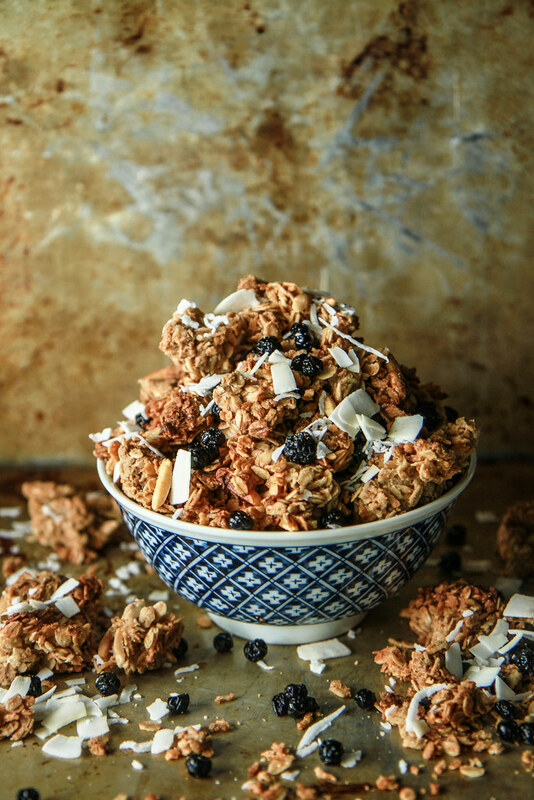 In a large bowl combine the oats, almonds and coconut. In a small saucepan combine the brown sugar, almond butter, maple syrup, coconut oil and vanilla and salt over medium low heat. Stir together until smooth and then add it to the granola. Stir well to coat and then transfer from the bowl onto a parchment lined sheet pan. Bake the granola at 350 degrees for 20 minutes and then stir and bake for another 15 minutes. Let the granola cool before breaking up and storing in a Tupperware or Ziploc. You have very interesting recipe combinations. My eyes widened when I saw the addition of almond butter. But then squinched when I saw the gf oats. Can this be made without oats. I don’t even eat the gf kind. Maybe spicy sticky toasted nuts: walnuts, macadamia, almonds, pistachio? Of course Nechama- Granola is so flexible- add whatever you like! Your book is gorgeous! And the food is top notch as always. Thats some tasty looking granola! I’m thinking I need a big bowl of this with my yogurt tomorrow morning!! I’ll take this on a big scoop of vanilla, please! Or in every way possible, I’m not picky. Congratulations again on your amazing book, lady!